Atherosclerosis is a chronic, progressive disease in which plaques build up in the walls of arteries. These plaques are formed by deposits of cholesterol and other lipids, calcium, and large inflammatory cells called macrophages. Once a plaque is present in an artery, it can cause several kinds of problems. First, plaques can protrude into the artery, eventually causing a partial or complete obstruction to blood flow. Stable angina is an example of a medical condition produced by a gradually worsening plaque. Second, plaques can cause arterial thrombosis. Arterial thrombosis occurs when a plaque suddenly ruptures, causing a thrombus (blood clot) to form. The thrombosis can lead to a sudden occlusion of the artery. One medical problem produced by plaque rupture is acute coronary syndrome (ACS). Third, plaques can weaken the wall of the artery causing a ballooning out of the artery to form what is called an aneurysm. The rupturing of an aneurysm often produces severe internal bleeding. A ruptured aortic aneurysm is an example of such an event. Other common medical problems caused by atherosclerosis include stroke, peripheral artery disease, and kidney disease. The fundamental underlying cause of atherosclerosis has not been fully established. Cholesterol abnormalities - high blood levels of LDL cholesterol and low levels of HDL cholesterol are associated with atherosclerosis. In Western cultures, even in childhood and adolescence arteries commonly show early changes of atherosclerosis. Atherosclerosis begins as a gradual, progressive disease that commonly will have developed over a period of decades before it ever begins to produce symptoms. 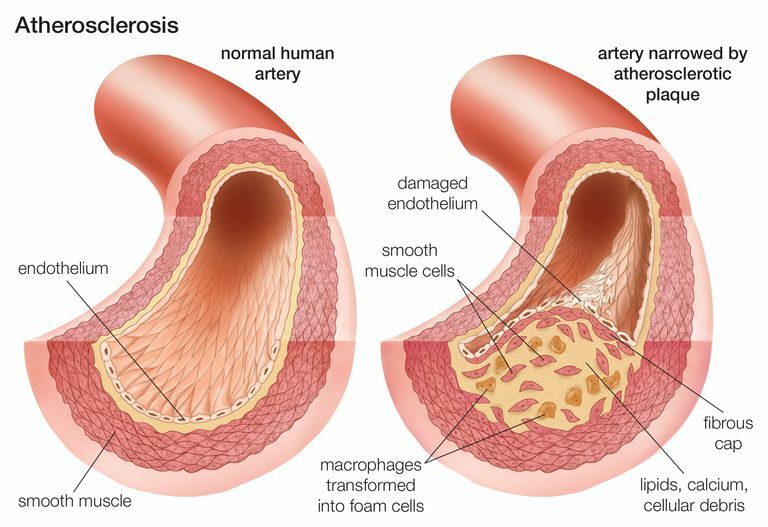 Atherosclerosis commonly affects the coronary arteries, leading to angina and myocardial infarction (heart attack); the cerebrovascular circulation (brain arteries), leading to stroke; the renal arteries, leading to kidney disease; the aorta, leading to aortic aneurysm; and the blood vessels of the arms and (especially) the legs, leading to peripheral artery disease and claudication, ulceration, skin changes, and slow-healing. Doctors spend a lot of their time treating the results of atherosclerosis—heart attacks, strokes, kidney failure, peripheral artery disease, etc. So treatments do exist for such things. But the treatments tend to be difficult, expensive, invasive, and/or risky. By far, the best “treatment” for atherosclerosis is to do everything you can to prevent atherosclerosis from occurring in the first place, or if it is already present, to take every available measure to keep it from progressing any further. These steps include eating a healthy diet, getting plenty of exercise, keeping your weight at an acceptable level, not smoking, and making sure your blood pressure is in a good range. Strong, JP, Malcom, GT, McMahan, CA, et al. Prevalence and extent of atherosclerosis in adolescents and young adults. Implications for prevention from the pathobiological determinants of atherosclerosis in youth study. JAMA; 281:727.